When Alessandra and Rupert invited me to join them in establishing Open Publishers as a Community Interest Company, I was delighted to accept. Having been a senior manager in the British Treasury I had experience of economic and financial matters, and that experience had first been brought to bear in my 2004 book, The Reading Nation in the Romantic Period, of which a free to read online summary was published later, as The Political Economy of Reading. That work showed, with plentiful quantification, how thin was the social layer of readers at that time who had been able to inform themselves about the ideas of, say, the Enlightenment. As a result of artificially inflated book prices very few had access to modern knowledge, with the vast majority confined to reading older, often long superseded, texts. This effect, previously obscured by the tradition of seeing the literary past as a history of writing rather than of reading, had been brought about by the industrial structures of the printed book industry, including technological limitations and intellectual property. Today in the humanities, although less so in the sciences, the same structures are still in place and still bringing about the same results, despite the fact that texts can be carried from author to reader instantaneously at minimal cost thanks to digital technology. A typical monograph in the humanities published by a traditional press has a shorter print run, around 300, than the 500 that was normal in the eighteenth century! For OBP’s first title in 2008, I was delighted to be asked to play the guinea pig as a proof of concept. That Greece Might Still Be Free, a much-cited book I wrote long ago about the philhellenes who went to fight for Greek Independence, was only obtainable at a high price on the second hand market. 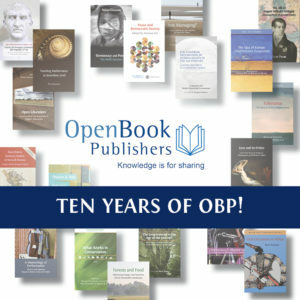 For the new open access OBP edition, besides revisions, we provided an updated bibliography, numerous pictures not present in the previous edition, and a tour of the changes since the first edition, provided by Professor Roderick Beaton, that is a substantial scholarly contribution in its own right. Since republication the book has attracted more readers than it had for many years previously. It also brought what for me is another delight: a correspondence with readers, not all of them academics, who wished to discuss particular points and engage. My book, that had lain for years entombed in the vaults of a handful of university libraries, was alive again! And it continues to thrive – in a few weeks time I am due to meet the Mayor of Peta in Greece where a decisive battle involving the philhellenes took place, at which an anniversary commemoration is to be discussed. Since our founding OBP has grown rapidly, as the charts on our site show. What the charts do not show is the mass of the iceberg below the waterline, which includes not only our staff but a vast community of authors, academics, librarians, and other experts round the world who enable us as publishers to maintain the highest scholarly standards and who, as a community, contribute to the taking back of knowledge from the private ownership of commercial corporations and making it available to those who are able to use it. The future is already here. So, come and join us. Remember, we do not charge author fees: no work that passes our stringent quality approval test will be turned down. To read an interview with the co-directors of OBP, Alessandra Tosi and Rupert Gatti, click here. This entry was posted in Tenth Anniversary and tagged Academic Publishing, Open Access, Open Book Publishers, Tenth Anniversary. Bookmark the permalink.